Hospitality is one of the great Irish gifts. We know how to entertain, and we know that wee people, leprechauns and children alike, can be quite temperamental if they are not properly entertained when visiting your home. Now, ideally, both are best kept amused in your yard if the weather permits because they are notorious for their power to inflict enormous damage when confined to indoor spaces. That makes summer an ideal time to make sure your yard is welcoming to both leprechauns and children. Happily, children and leprechauns have a lot in common and are generally interested in the same sorts of things, primarily getting into mischief, enjoying various treats and enjoying a good laugh. They both love the outdoors and treat the world as their playground to explore. Both can work magic on your heart and wreck indescribable havoc on your life with a charm that makes it impossible to remain angry. Invite them outside with Celtic design stepping stones in a garden path, and add intrigue with beautiful and fun Irish garden stones. You can even get personalized ones to commemorate births or marriages, which also make delightful Irish gifts for weddings. These special stones will add a bit of joy and beauty to any garden even when the flowers are not in bloom and the garden is not full of visitors. The wee ones might feel more welcome if they can see you do welcome them and you even provide a bit of company for them. You can find all sorts of cute garden decorations featuring leprechauns – from solar lights that help them see how friendly your yard is even when the sun sets to bird feeders to also invite some feathered friends to the fun. If you don’t have a green thumb, you know who does. Help out those flowers with a leprechaun planter if they need some magic beyond your own powers. 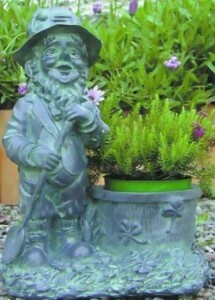 Irish gifts for the garden add a magical touch the help both children and leprechauns remain happy. But how will they know to even peek in your yard to see what a magical, welcoming place it is? You need a way to roll out the welcome…well, you need an Irish welcome matt to broadcast your hospitality. A green, white and orange flag will help them spot you from further away, and a house number or name plate with a pretty Irish design will confirm that they are exactly where they are supposed to be. If you are frequently visited by little people – or hope to be – you can transform your outdoor space into a magical and welcoming bit of the old country with a few Irish gifts for the garden. Of course, it is your yard and you will enjoy the charm of some Celtic decoration the most. A few little touches and garden decorations can make a big difference and make your garden really your own special place – one that the wee people will remember as the setting for their own wonderful memories. Is Your Four-Legged Best Friend Irish?